Bloomberg News reporters are worrying for their future should the billionaire owner of Bloomberg L.P. run for president in 2020. Michael Bloomberg is the founder, CEO, and owner of the mass media and financial services company, one division of which is a top international news network. "A lot of people are confused and don't really know what to expect in the next two years," a Bloomberg News staff member told Buzzfeed News. Another staff member described the environment within the organization as "semi- but not acutely anxious." In an interview with Radio Iowa this week, Bloomberg said that he would likely step back from his company if he ran, and ultimately put it into a blind trust or sell it if he won the presidency. Bloomberg, who is 76-years-old, says he would prefer to sell it. "But I think at my age, if selling it is possible, I would do that," Bloomberg said. Reporters at Bloomberg News are also concerned about how they would cover the potential nominee. "Quite honestly, I don’t want all the reporters I’m paying to write a bad story about me," he told Radio Iowa. According to Buzzfeed News, top-level editors have not communicated with reporters about Bloomberg's remarks or what the future of the company might be should Bloomberg run and be facing political coverage. Bloomberg News has historically not covered their own company in the news, including Michael Bloomberg himself. 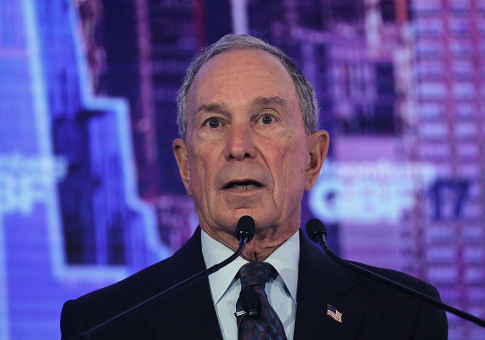 Bloomberg's presidential announcement would likely come in the next few months. He previously flirted with running in 2016 and changed his registration to Democrat back in October. Bloomberg served as the Republican mayor of New York City from 2002 to 2013. Bloomberg has been in Iowa this week and in an op-ed in the Des Moines Register said his visit centered around climate change and the actions Iowans are taking. He alluded to a previous op-ed in the paper saying that potential presidential candidates needed to "present a bold vision for taking action on climate change" and responded by saying, "I couldn’t agree more: We need stronger leadership in Washington on this issue. But Americans aren’t waiting around for it." This entry was posted in Politics and tagged 2020 Election, Bloomberg, Michael Bloomberg. Bookmark the permalink.